The Mu Phi Chapter of Omega Psi Phi Fraternity, Incorporated will host Mardi Gras 2016, April 15, 2016. Doors open at 8:00 p.m. at the Savannah Civic Center Arena. Mardi Gras is the chapters Annual Fundraiser supporting the chapters Scholarship program and Habitat for Humanity. 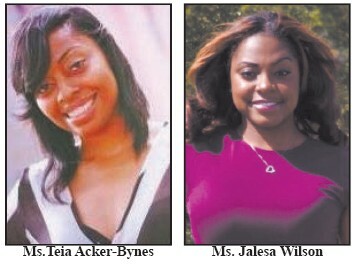 The 2016 Mardi Gras contestants are Ms. Teia Acker-Bynes and Ms. Jalesa Wilson. A native of Savannah, Georgia, Teia Acker [Bynes] has always had a passion for helping others. In 2004, Teia graduated from Georgia Southern University with a dual bachelor’s degree in Health Science (Community Health) and Kinesiology (Exercise Science). While there, she received the “President’s List Award for achieving a perfect 4.0 GPA in one Semester. Although becoming a physical therapist was a lifelong dream for Teia, she decided to pursue a career in community health after engaging in an internship in the public health sector of a local hospital. It was there where she discovered the essence of helping others and engaging a network of community services into meeting and servicing the needs of its people. Determined to make a significant difference, Teia set out to pursue a Master’s Degree in Business Administration from The University of Phoenix. She graduated in the top 10% of her class in December of 2008. Faced with the dilemma of inexperience in the business sector, Teia decided to create a business of her very own; one that would not only establish her in the business arena, but one that would also enable her to make a difference within her community. She is the owner of the Savannah–based business Ebony & Ivory Professional Services, Incorporated. She is currently enrolled as a doctoral student in Business Administration at Walden University. Aside from working in the professional realm, Teia is an active member of First Jerusalem Missionary Baptist Church under the pastoral governance of Pastor Damion P. Gordon. There she is a member of the Mime Ministry and the praise & worship team. Teia is proud member of the Savannah Alumane Chapter of Delta Sigma Theta Sorority. Ms. Jalesa Wilson hails from the city of Riverdale, Ga. Jalesa is the only daughter of the late Mrs. Janice Wilson and Gregory Wilson. Her beloved mother was her dearest friend and she strives to make her proud daily. Jalesa has a three year old daughter named Sydney J. Miller. As a valued Savannah State University Class of 2013 graduate, this dedicated alumnae holds SSU dear to her heart. She currently serves her Alma Mater as an undergraduate Admissions Specialist and is the Secondary Advisor of the campus organization Eloquent Commitment to Helping Our Sisters. Jalesa is also a mentor to several young women attending SSU. Jalesa’s commitment to her faith is evident as she volunteered through college at College Park Baptist Church where she currently serves as the Youth Praise Worship Choreographer. Earning a B.S. Biology degree is one of Jalesa’s greatest accomplishments. As a SSU biology major she worked tirelessly in researching treatments for Breast Cancer. In the spirits of light and love, her passion to raise breast cancer awareness and keep the candle of her mother’s legacy burning, Jalesa is an active annual volunteer crusader for Susan G. Komen of Coastal Georgia. Jalesa is proud to be a Mardi Gras contestant because her love for education, outreach and community service are forever at the forefront of her everyday living.